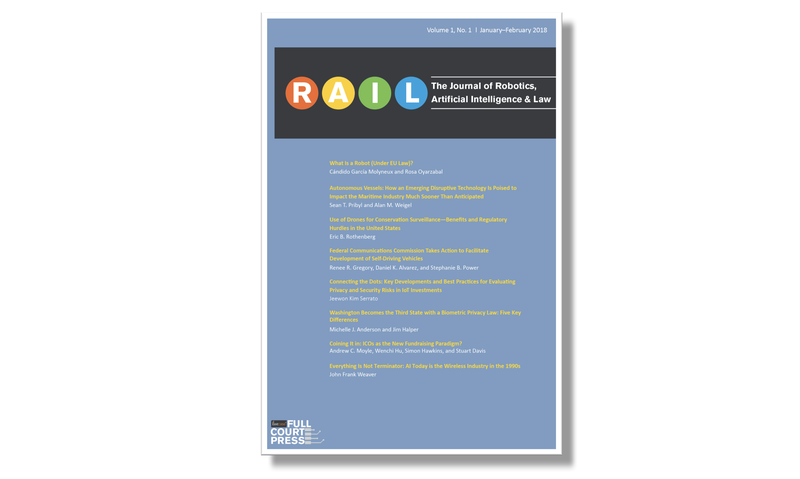 Washington, DC (November 2, 2017) – Today Fastcase announced the November launch of its inaugural publication, RAIL: The Journal of Robotics, Artificial Intelligence & Law, continuing its quest to add unique, must-have content for its subscribers and provide leading legal analysis with contributions from firm partners across the country. The publication of RAIL is the first title from the new Fastcase imprint, Full Court Press, the new publishing arm of Fastcase. RAIL is a multimedia offering, available in print, as an eBook, in audio, and exclusively within the Fastcase legal research application. Fastcase co-founders Ed Walters and Phil Rosenthal continue to challenge the status quo in the legal publishing industry. Since founding Fastcase in 1999, they have consistently pursued the mission to democratize the law, making it more accessible to more people. In bringing Steve Errick to the team as Chief Operating Officer earlier this year, Fastcase began pursuing additional opportunities to build out original authored works. “Steve is a publishing pro, bringing in top talent to drive the program and showing our team the value of developing author relationships that will add to the long-term success of Full Court Press in creating leading authored analysis. As other publishers retreat from books we’re uniquely positioned to start a print plus imprint that incorporates our expertise in technology and online publishing whether to help support and drive the book programs of our state bar partners, or in launching our own imprint,” noted Fastcase President Phil Rosenthal. The 2018 roadmap for Full Court Press includes co-developing digests, journals, books, and blogs with an array of partners, including state and specialty bar associations, leading law schools and law firms, and franchise authors who have a long history of working with Errick, and who embrace Fastcase as a steward of their works. Senior Vice President, Meyerowitz Communications Inc.
Chief Executive Officer, Fastcase, Inc.
As the smarter alternative for legal research, Fastcase democratizes the law, making it more accessible to more people. Using patented software that combines the best of legal research with the best of Web search, Fastcase helps busy users sift through the clutter, ranking the best cases first and enabling the re-sorting of results to find answers fast. Founded in 1999, Fastcase has more than 800,000 subscribers from around the world. Fastcase is an American company based in Washington, D.C. For more information, follow Fastcase on Twitter at @Fastcase or visit www.fastcase.com.